Growing up we had a huge room for our laundry room. It was a big old farmhouse, and it had those great wood cabinets that went all the way to the ceiling, cabinets and counters everywhere. Lots of windows for natural light. Even then, when I was too young to know anything about the value of good counterspace and a deep farm sink, I remember loving all the workspace. 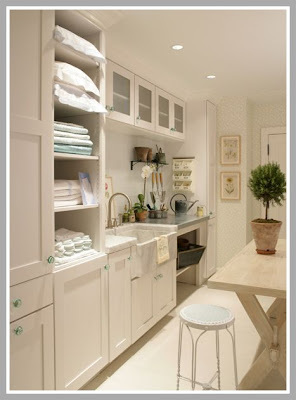 Sadly, in my current home, I don't have a huge room to use for my laundry room. I gave it up to my husband for a workshop. A backhanded gesture since he spends his time in there fixing and building the furniture I paint! Anyway, my "new" laundryroom is in the basement, so has no luxury of natural light, and is only an unfortunate 7 ft x 8 ft. So...there goes my dream of a center island for folding. I am looking for a gorgeous yet space saving and efficent layout. Do you have a front load washer? ?...and if you do...do you love it..or hate it? I am not totally sold on the whole front load thing, anyway. Maybe it is because I am tall. At 5'11" those front loaders seem pretty short! It is going to be like doing squats every day getting the laundry in and out. Not that its a bad thing, I guess. Maybe my bum would shrink a little. But I like the idea of having a counter on top, especially since my room is small. Is this a good idea? I am not sure...I would love to have the drawer underneath just for the sake of making them more user-friendly. I think having them right at my height would be a great idea. Oh, and I am throwing the picture in below just becuase I think the sink is so stinkin' cute!! I hope some of you will leave me a comment on your opinion of the front load washer. Are they really worth the expense? Do I want a counter over it, or should I have a drawer under it to make it a more comfortable?? Can't wait to show you the before and after pictures! Definitely front load with the drawer bases and a counter! I think the front load is more efficient in a small space...as long as you have room to open the doors. 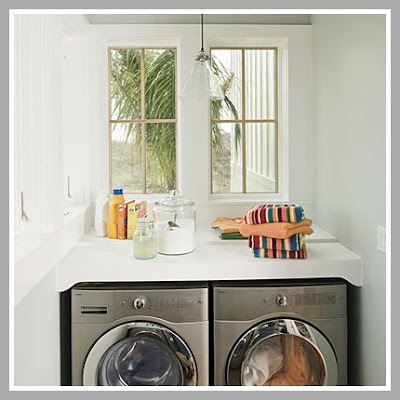 It is much easier to move items from washer to dryer when they are side by side openings versus a top opening washer to front-loading dryer. i'm 5'9" and have a front loader and I do spend some time bending down - but I love all the space on the top and will choose a front loader over and over again. 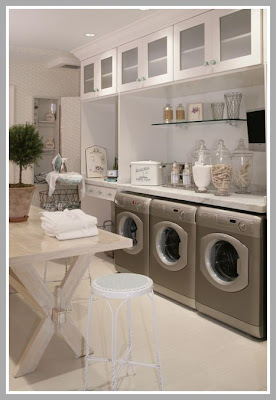 I can't speak for the laundry load debate, but I can say that laundry would become my favorite activity if I could do it in any of the rooms you featured in this post. SO AWESOME. Thanks for visiting my photography blog! 1. I love my front loader. It is about the clothing themselves. Front loaders don't do near the damage as the others. U also use less soap etc. If you care about the "care of your clothes" than go with front loader (also great for comforters, slipcovers etc.). 2. Do you need floor space or counter space? I needed floor space so I stack my front loaders (u can buy a $25 kit to stack them). But if you need more counter space then don't stack. 3. I need more "hanging to dry space". I still have to figure this one out. My laundry room serves two purposes A) Laundry B) Animals. I also feed and kennel my animals in this space (hence the need for floor space). I actually use one of my base cabinets for their beds etc. At night I just open the cabinet doors and they crawl right in! 4. Can you tell I love laundry too?? I'm not sure if I would want the front loader as I have never used one. I guess I would have to see the pros and cons...Knowing how I bend and search for an item in the dryer, I assume it would be the same thing, only with wet clothes!! For once I am not having problems with my appliances, so I don't dare think about new ones! lol!! I had to come and visit because I saw your link to the Kane County Flea Market at Flea Market Style website. I am from Chicago! I haven't been to the KCFM, but my sister went every month and I never got the chance to go with her. But I WILL!! You have a great blog. Can't wait to see what you do with the laundry room. Maybe I will get some ideas, mine is a mess! Oh, I meant to ask you, are you going the Kasey's event on the 5th? I think it is going to be so much fun! hi mary! i just found your blog and love it! i do have a front load washer and dryer and i love them! i too plan on adding a counter top! 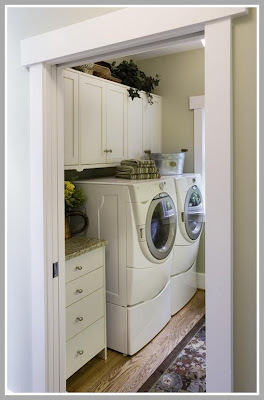 i have a very very small laundry room and think it would be very useful! so, i say get the front loaders, the drawers that go underneath, and maybe, since you are tall even do a countertop! hurry! i cant wait to see the results! i am becoming a follower! i would love for you to stop by for a visit over at my little blog! thanks! Not sure if you've decided yet as I just came across your blog. Hubby bought me a front loader washer and dryer after the ones we bought 20 years ago when we got married were on their way out. I love mine! We bought the Electrolux as it was the largest capacity. We have a family of seven. I love it. I can wash twice as much in less time and dry 4 times as much in the same amount of time. For us, it's been wonderful. 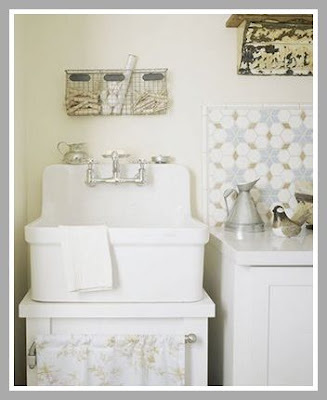 Just came across your blog and your post on your laundry room. 1. I bought front loaders two years ago when we bought our house...previous owners took the washer/dryer when they moved and we left ours at our last home. So, I purchased front loaders. I love having the folding space on top and I love the efficiency (uses much less water and the washer is much gentler on clothes (as there's no centre agitator for clothes/sheets to get wrapped around). I didn't purchase the drawers/stands as it would have made the washer/dryer too high for a folding counter (I'm 5'6"). Extreme Home Makeover...watch Sunday night! ooh la la...and a giveaway alert!